It’s Sunday afternoon and I’m walking around the house, trying to figure out how I’m going to complete everything on my weekend to-do list. I’ve been so busy with other projects lately that housework has taken a back seat - and it’s beginning to show. The dishes are dirty, the floors unswept, and the smells emanating from the garbage disposal have set off the carbon monoxide alarm. I have two choices: Clean or move. I scan the living room and my eyes find my husband, lounging lazily in front of TV. He’s munching on Cheetos and cycling through a series of football games, completely unaware that our house is one mouse shy of being condemned. He has, I’ve discovered, a superpower: the complete inability to see filth. “What’s wrong babe?” He asks. He may not notice a mess but he can always feel my disapproving eyes on him. Another superpower. When I don’t answer he extracts himself from the couch and plods towards me, offering me his bag of chips. “Anything I can do?” His gaze stays with me only for a second before sliding back to the game. Someone in a blue uniform catches a ball and my husband raises his arms in victory, launching several Cheetos in my direction. “The house looks fine,” he says. “What do you know how to do?” I ask dubiously. To this day the only evidence I’ve seen of his domesticity is that he lives in a house. “Are you sure? Maybe you should dust the furniture." My husband is a smart man. He wears khaki pants to work, crunches numbers, and manages people at his office. If he says he can handle the laundry, I have to believe him. I start on the dishes, wondering if we should just get a new set, when I see my husband trot down the stairs with a basket of clothes piled so high I can’t make out his face. “I didn’t realize we had so many dirty clothes,” I say. “Sorry babe,” my husband says, offering to do a sniff test. I tell him that it’s okay, we will just wash them all again, and I follow him down to our laundry room. When we get there he turns on the machine, dumps in half a box of detergent, and starts adding the entire contents of the basket into the washer. I groaned. Whenever he wants to win an argument he quotes Marilyn vos Savant. But I wasn’t buying this one and I googled it. At least I saved mine, I think. And then a terrible thought occurs to me. 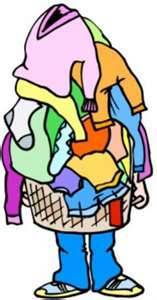 “Honey…what did you do with the clothes that were in the washing machine?” He didn’t have to say a word. A buzz from the dryer confirmed my deepest fears. “We live in the Suburbs!” I say. If I went out in this I’d be banned from schoolyards, libraries, and The Home Depot. But maybe not Lowes. “Okay, baby. But only if you’re sure.” My husband takes the chips and disappears into his mancave, and somehow I manage to do everything on my list that day. I guess all I needed was a little extra motivation. And maybe that's his real superpower after all.